David Putano, HPMT, MT-BC is a board certified music therapist in private practice in Toledo, OH. David started playing drums at age 7 and played actively (lessons, school band and orchestra, drum corps) until age 14 when he switched his focus to guitar. David took guitar lessons all through high school. In 1977 David finished an associates degree in Liberal Arts at Broome Community College in Binghamton, NY then went on to study music at the State University of NY at New Paltz and Berklee College of Music in Boston, MA as a guitar performance major. From there David went on to play music professionally full time, traveling all around the country, playing popular music and jazz. 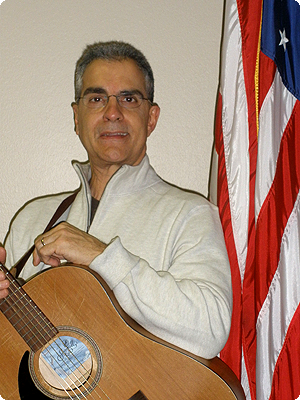 After eight years as a singer, guitarist and band leader David started his music therapy studies at the University of Georgia then transferred, ultimately receiving his music therapy degree in 1991 from Eastern Michigan University (MT-BC). In 1992 David was hired as a staff music therapist at St. Vincent Medical center in Toledo, OH where he worked primarily in the departments of psychology and chemical dependency. Also during this time David received valuable music therapy experience working in various hospital departments including pediatrics, oncology, cardiac rehabilitation (doing music therapy/stress management lectures) and started working with Dr. Marion Boss in 1992 providing music therapy for autistic pre-schoolers at the school S.A.I.L., which continues to this day. When hospital programing changes occurred in 1998 David was prompted to start his own private music therapy practice. In 2010 David completed a Hospice, Palliative care Music Therapy (HPMT) certification from The Center for Music Therapy in End of Life Care (Chicago, Ill). Today David’s private practice consists of music therapy with hospice patients and their families, pediatric and adolescent behavioral music therapy at Toledo Children’s Hospital, music therapy for autistic pre-school and school age children at S.A.I.L., music therapy to support academics for the Perrysburg (OH) school district, as well as work with the geriatric population and adult developmentally delayed individuals in groups. From 1992 to present David has consistently provided music therapy educational presentations to college music therapy departments, hospitals, professional groups, businesses and schools. Also, David has been writing original music since 1981 and records various styles of music including music for educational development and autism. In 2012, David opened musicfromthestart.com, a web site that offers original music for child development and the autistic populations as well as providing other music therapy related education courses, research and information. David’s music therapy “blog” can be accessed here also. And in 2014 David opened an educational web site for music therapy professionals and students called guitarplaylikeapro.com. This site offers video based guitar lessons, teaching guitar accompaniment (how to accompany yourself and others, to play songs – not for lead or classical guitar). This site is for anyone wanting to become competent on the guitar. Also, from the categories of lesson topics, continuing education courses are offered by the Spiegel Academy, for music therapy professionals.